Drill for oil like it's 1899! 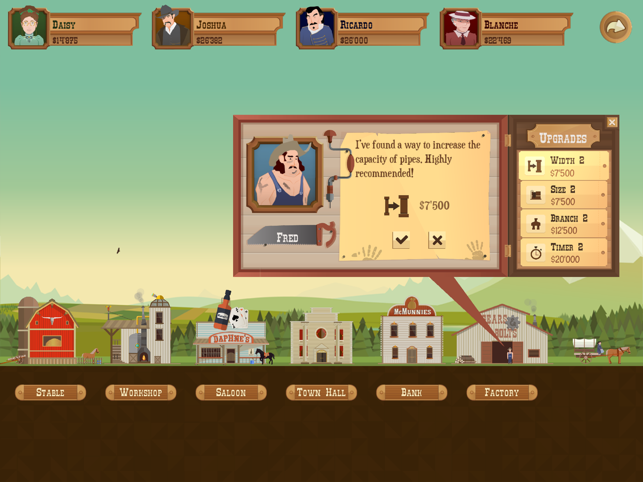 -A campaign where you build your rags-to-riches oil baron career and beat your rivals. 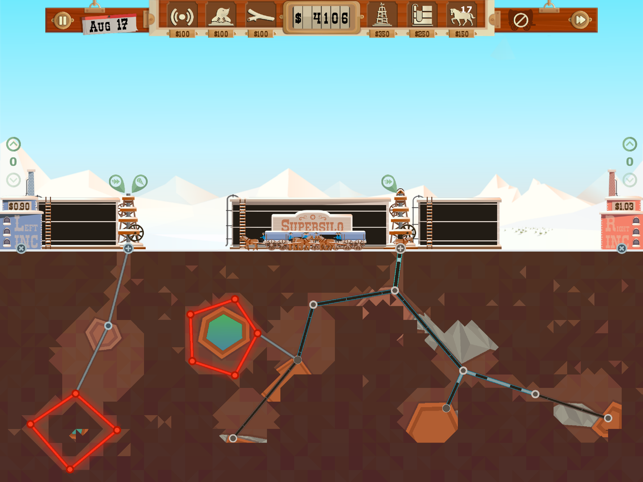 -Dozens of upgrades and new tools to improve your oil mining operations. 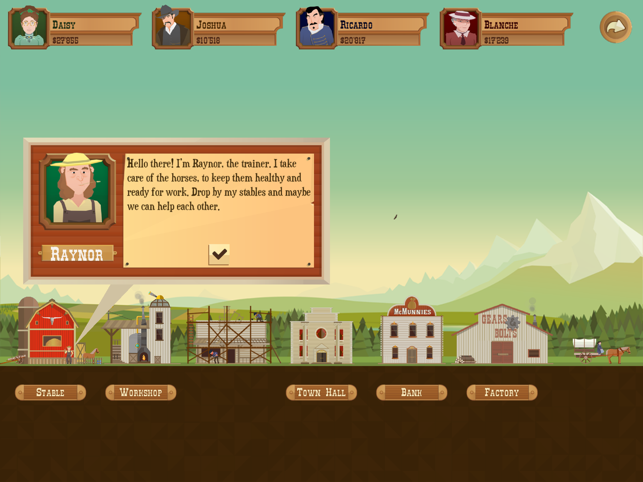 -Meet the town’s characters in the saloon and make shady business deals. 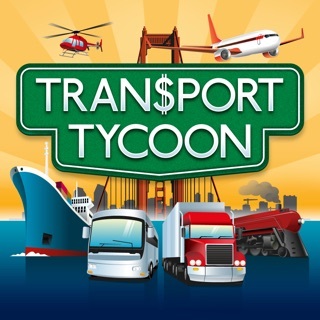 -Play single game mode to get one of literally millions of procedurally generated levels and earn as much as you can in one year. 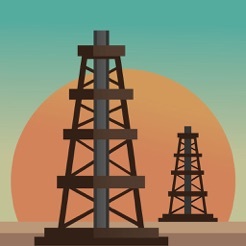 -Lease land at the town auction and search for oil using a dowser, mole or scanner. 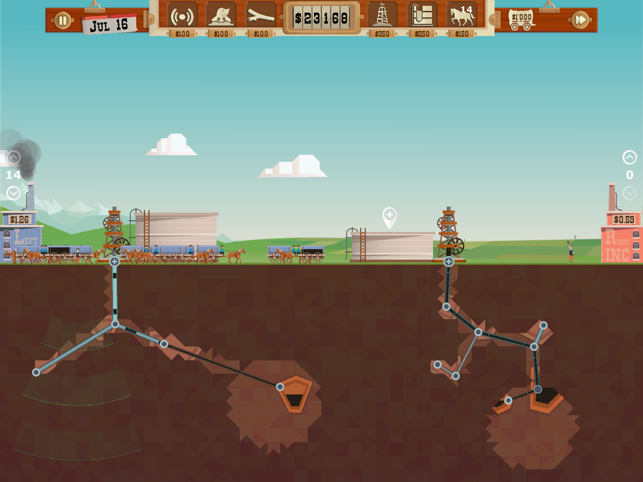 -Maximize your profits by using natural gas to boost the oil price. -Outbid your competitors at the stock auction. - Fixed the crash that occurred on certain iPads. - Added App Information language compatibility (Russian, Portuguese (Brazil), Chinese (Simplified). Good game, a bit pricey though. I bought this after seeing it randomly on the App Store over the last year. Glad I bought it, but arguably so. It’s a solid game that runs well with few bugs it seems. Has a unique strategy element that’s refreshing, but once you figure out the trick, it’s easy to crush the levels in the campaign. The sound has a weird glitch that has the sound of the pump never stopping until you close the game out completely then reopen. Doesn’t affect gameplay but is obnoxious. You can’t even turn it down or mute it with the in game sound controls, only by muting the iPad completely. I can’t say I recommend it to most people for the $6 price point, but if it goes on sale to $3 or less, it’s worth the scratch. Keep an eye on it for such a deal or price drop. Great game! Needs a few things fixed to be perfect. 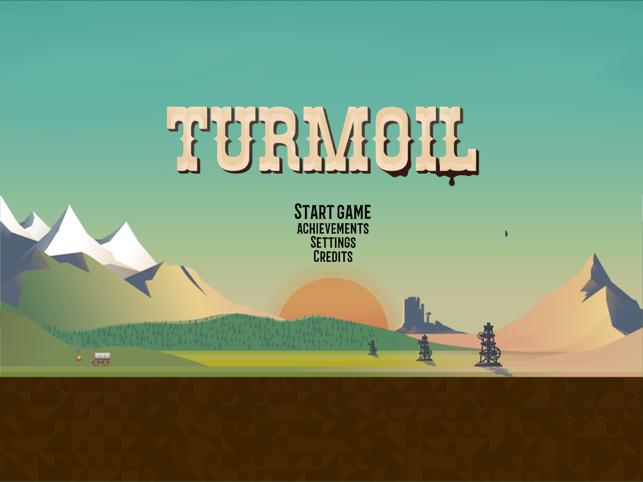 First, this is a really fun, addictive game. The last update fixed all my crashing issues on an iPad mini. As others have said, it needs a few things changed to make it perfect. Please fix the annoying sound that persists in the background sometimes. Also, please make the text larger, and more visible, like not having white letters over the white clouds. And, most of all, fix the save game system. If the game sits idle and resets, you lose all saved progress. I've lost many great levels that way. It needs to auto save at that point, or provide a manual save option. I love Turmoil. I originally got it on my computer, and then bought it for my iPad. I love how I can now play it anywhere on my iPad. Especially if there is no wifi connection! My only criticism for the iPad version is that I wish the achievements button worked. I know what they are from the computer version and just wish those would work for the iPad. I hope it will work in a future update. Until then I'll keep drilling for that sweet, sweet oil. Requires iOS 8.0 or later. Compatible with iPad Wi-Fi (3rd generation), iPad Wi‑Fi + Cellular (3rd generation), iPad Wi-Fi (4th generation), iPad Wi-Fi + Cellular (4th generation), iPad mini Wi-Fi, iPad mini Wi-Fi + Cellular, iPad Air, iPad Air Wi-Fi + Cellular, iPad mini 2, iPad mini 2 Wi-Fi + Cellular, iPad Air 2, iPad Air 2 Wi-Fi + Cellular, iPad mini 3, iPad mini 3 Wi-Fi + Cellular, iPad mini 4, iPad mini 4 Wi-Fi + Cellular, 12.9-inch iPad Pro, 12.9-inch iPad Pro Wi-Fi + Cellular, 9.7-inch iPad Pro, 9.7-inch iPad Pro Wi-Fi + Cellular, iPad (5th generation), iPad Wi-Fi + Cellular (5th generation), 12.9-inch iPad Pro (2nd generation), 12.9-inch iPad Pro Wi‑Fi + Cellular (2nd generation), 10.5-inch iPad Pro, 10.5-inch iPad Pro Wi‑Fi + Cellular, iPad (6th generation), iPad Wi-Fi + Cellular (6th generation), iPad Pro (11-inch), iPad Pro (11-inch) Wi-Fi + Cellular, iPad Pro (12.9-inch) (3rd generation), iPad Pro (12.9-inch) (3rd generation) Wi-Fi + Cellular, iPad mini (5th generation), iPad mini (5th generation) Wi-Fi + Cellular, iPad Air (3rd generation), and iPad Air (3rd generation) Wi-Fi + Cellular.